Something that I hate to do is pack a suitcase. It feels like a challenge, fitting a week or a few weeks worth of outfits into one space can be quite stressful, but thanks to my last trip to Lisbon, I decided that this time I’m going to pack my case a little more sensibly. With that, you can see that I’ve booked another trip to Lisbon. Actually, the day this goes up is the day that I board the plane to go. I loved it so much in December that I wanted to go back and stay for longer. I want to see more of what Portugal has to offer, but that’s besides the point of this post. Here’s a few pointers on how to pack your suitcase, and how I packed mine this time. I went to Instagram before writing this post to see how many of you used the tips I was thinking of writing, and I was actually surprised that not many people do. So, if you’re one of the people who voted in the polls and you’re going abroad this year, these tips might be helpful to you! I got my suitcase from Revelation! for £30 (it was on sale though the RRP is £60), I needed to get a new one because the ones we have may be large, but I don’t feel like they have enough space in them, and they’re also really bulky and hard to take around with you. I also have a carry on cabin case but it’s tiny and I didn’t want to take two suitcases with me, so going out and buying my own case seemed like the best option. 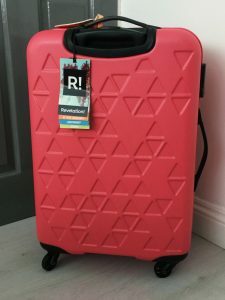 I really love this case, it’s a beautiful colour and also has a self locking mechanism, so you don’t need to worry about going out and getting a mini padlock to put on your case. I did pack a lock though just in case the one installed in the case broke for whatever reason. The inside of the case is also really great, you can use both sides to pack your belongings into and the blue just looks nice against the pink shell. Before I begin packing, I like to look at a check list to make sure that I’ve got everything that I need and that I’m not missing anything. I’ve put together a little check list and you can download it if you like from this link here, there are a variety of options for you to choose from if you want a girlier design, a unisex design or a manlier design and for all the parents out there, I’ve put together a baby edition too. You also do need to zoom out for it to show though and there are a variety of sizes for the unisex version from A4 to A6. 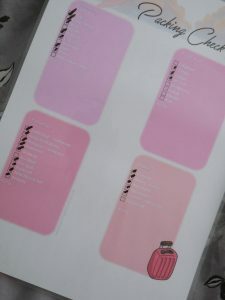 I really believe that having a check list is seriously super important, especially for people who are like me and are quite forgetful, it genuinely stops you from forgetting certain things and if you’re buying things to pack, you can also take it out with you as a little shopping list. I laminated mine and bought some whiteboard pens to tick off the things that I’ve already done so that I can reuse it in the future. When it came to actually packing my case, last time I sort of just dumped everything into the case, it was a small cabin case and I was only staying for four nights, so I just figured I wouldn’t need that much organisation in the case, but when it came to repacking it we did struggle, so this time I decided to buy some packing cubes from Amazon, you can get them in three sizes, small, medium and large which is super helpful for keeping efficient. I bought these ones, I like them because they’re just pink and girly but you can get them in other colours too. 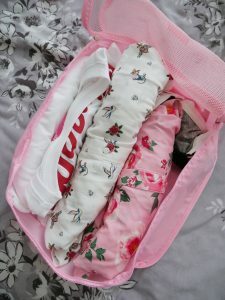 The way I packed the cubes was by folding my items how I would usually fold them, which is basically just by folding in the arms of my shirts and dresses, and then folding over to get them in a square shape, and then I rolled them up. 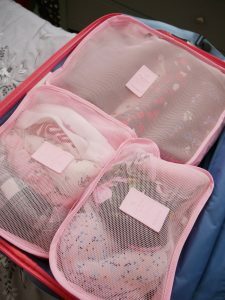 Rolling the items helps decrease wrinkling and it also makes it easier to make the space for everything that you want to pack, and in the event of your case being knocked around, nothings going to unfold. 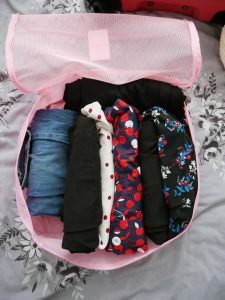 I put my bigger items, like my dresses and jeans in the biggest cube, and my smaller items like t-shirts, pyjamas and blouses in the medium sized cube, and then underwear and accessories in the smallest one. When the cubes are in the suitcase, they’re designed to leave you with space to fill up around them, they’re super lightweight too so they won’t take up any weight. Now, for my shoes, I bought some shoe bags, also from Amazon. I like these just because it keeps your shoes which have been on the ground outside, away from your other possessions. They’re huge too so you can fit two pairs of shoes in one bag, maybe more depending on your shoe size. Pull on the draw string and your shoes are nice and secure. I packed all of my makeup, toiletries, medication and small bits such as those adapters that let you use your electronics in other countries in a black vanity bag. It was really cheap from B&M and I was really surprised by how much stuff fit into it, I didn’t take small bottles either so I’m definitely very impressed, it also cleared up space so there wasn’t any need for extra bags for my makeup which I liked, it was definitely worth picking this up. 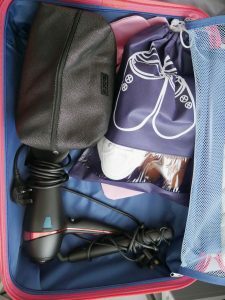 I left enough space for my hair tools, and for my camera bag too, even though it’s not pictured because I was using my camera to take these pictures, I wanted to leave as much free space as possible. When I weighed my case it came to 16kg – I had a 23kg limit, so I was quite pleased with the amount of space I had left. Obviously this meant I could pack new things in my case, but I’d also probably be leaving a few things behind anyway (like face soap and disposable things like wipes) and I also packed some English snacks for Pedro to try, so they’d be eaten and not getting repacked anyway! Overall, I found packing my case really easy, it was super organised and everything had a place. I hope my tips were helpful for you and you’ve learned some new things to try out for yourself!